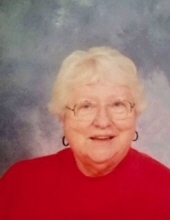 Vinton—Doris Jean Meredith, 87, died peacefully at home surrounded by her family and friends on Wednesday, March 27, 2019. A memorial visitation will be held at Van Steenhuyse-Russell Funeral Home from 11 a.m. to 2 p.m. Saturday, April 13, 2019 with a Celebration of Life Service at 11 a.m.
Doris Jean Lawson was born December 7, 1931 in Compton, IL, to Sam and Marie Grimes Lawson. She grew up and attended school in Ashton, attended Coe College and graduated from Arizona State College at Tempe. She was married to Roy Richardson for fifteen years, they had three children, Sam, Rachael and Sarah. They later divorced. On November 24, 1979 she married Charles L. Meredith in Vinton. Doris taught fifth grade in Vinton and she was a co-owner of Bette’s Fashion with her sister, Lois. Doris was instrumental in founding the Benton County Food Bank and devoted much of her time to it. She was an avid bridge player, belonging to multiple area bridge clubs. She was a devoted and generous benefactor to the Linn County Salvation Army. She was preceded in death by her parents and brother, Stanley Lawson. The family will direct memorials to the Benton County Food Bank and the Linn County Salvation Army. Van Steenhuyse-Russell Funeral Home is caring for Doris and her family. Condolences may be left at www.vsrfh.com. She is survived by her husband, Charles L.; children, Sam (Pepper) Richardson, Arvada, CO; Rachael VanValkenburg, Sister Bay, WI, Sarah (Dale) Schian, Phoenix, AZ, Paula (Kyle) McCuen, Montezuma, IA, Mike (Dana) Meredith, Centerville, IA, Dave (Kim) Meredith, Manchester, IA; 18 grandchildren; 21 great grandchildren; sister, Lois Watson, Iowa City, IA, and sisters-in-law, Charlene Culbertson, Elkader, IA, and Angie Lawson, Phoenix, AZ and brother-in-law, Wilson Richardson. Doris lived her life her way. To send flowers or a remembrance gift to the family of Doris Jean Meredith, please visit our Tribute Store. with a Celebration of Life Service at 11:00. "Email Address" would like to share the life celebration of Doris Jean Meredith. Click on the "link" to go to share a favorite memory or leave a condolence message for the family.